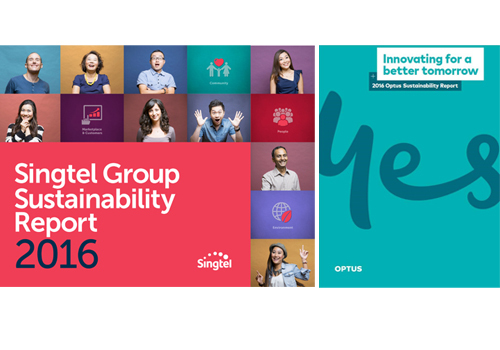 The Singtel Group Sustainability Report 2016 is the company’s second Group report which covers the sustainability strategies, initiatives and performance of its operations in Singapore and Australia for financial year ended 31 March 2016 (FY2016). The report provides details of Singtel Group’s commitment towards creating sustainable and long-term growth for its business, while leading and shaping positive change for its four sustainability pillars namely marketplace and customers, the communities it operates in, its people and the environment. The report has been prepared to be in accordance with GRI G4 – Core Level and is independently assured to the AA1000 Assurance Standard and ISAE3000. Singtel Group is also committed to the UN Global Compact 10 principles since 2007 and the report presents the company’s Communication on Progress. The Group’s scorecards on key performance indicators. In addition, Optus, Singtel’s wholly-owned subsidiary in Australia, continues to produce a standalone Sustainability Report titled ‘Innovating for a Better Tomorrow’ that gives details on its sustainability programmes in Australia. Raised the bar with its suppliers through its Sustainable Supply Chain Management programme. Risk assessed 75% of group spend and are now working on the various risks and opportunities. Optus’s goal is to be Australia’s most loved, recommended and innovative service brand. It continually strives to live its values and is committed to help the nation be more sustainable. Singtel is Asia's leading communications group providing a portfolio of services including voice and data solutions over fixed, wireless and Internet platforms as well as infocomm technology and pay TV. We have presence in Asia, Australia and Africa with over 600 million mobile customers in 25 countries, including India, Indonesia, the Philippines and Thailand. We also have a vast network of offices throughout Asia Pacific, Europe and the United States.